Are you almost discouraged by your poor social media reach? Do you always imagine there are tools that can make your social media campaigns worth your effort and time? Do you always wonder if your posts are actually going to get any Likes and Shares or even reach the right audience? If your answer is yes, then you’re not alone. A lot of people like you out there are facing same challenges and just as always I have taken the time to search and compile a list of amazing though premium social media tools you can invest in as a blogger for effective social media reach/growth. Creating and managing contents on social media can be sometimes a difficult task, so I am going to suggest some tools that can make your social media activities easier and more productive. Sometimes you cannot get desired results doing something manually all by yourself. I used to be like you when I felt I could do it all by myself, when I felt I don’t have to spend a dime and yet expected to get good results. Well sorry to disappoint you, it doesn’t often work that way, as a blogger there are things you can’t do alone, you need the right tools to get them done effectively and on time too. Imagine how long it could take you to post and reply to comments on 50 Facebook groups for instance. You need the right tools to get your job done and such tools though premium often make the difference. It is tempting to settle for the free versions but they are always limited in features. I will advise you to invest in some of these premium social media tools to help your social media campaign and growth. Hootsuite is my favorite premium social media tool. Hootsuite is a powerful social media automation tool that makes it very easy to share posts on a variety of social networks such as Facebook, LinkedIn, Google+, Twitter and other social media sites. With Hootsuite I can share to multiple social media accounts at once and can access all my linked social media accounts on same interface which makes it easier for me to effectively manage my social media activities and reach a wider audience. For just $10 a month you can link up to 50 social media profiles and an unlimited number of RSS feeds while the free version is only limited to 5 social media profiles and two RSS feeds. Hootsuite supports multiple Twitter accounts, personal Facebook profiles, pages and most importantly groups, LinkedIn profiles, company pages and groups. It also supports Foursquare, Mixi, Tumblr, Youtube and also supports Google+ pages through RSS feeds. With Hootsuite you can post to all your linked social media profiles, pages and groups at once and this will definitely help you reach a wider audience in no time compared to manually doing them. 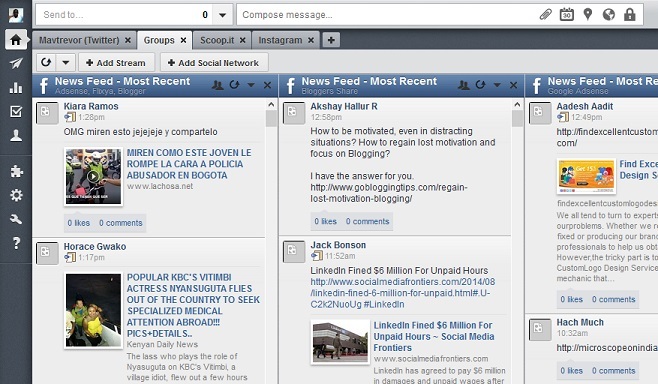 Hootsuite can also be used to schedule posts on social media sites like Facebook, Twitter, and LinkedIn etc. Buffer is another premium social media tool you should invest in as a blogger. It’s similar to Hootsuite discussed above. It also supports multiple social media profiles, pages and groups and has even gone further to add App.net. For same $10 a month allows you to link up to 12 social media profiles and 2 team members. Buffer is indeed an awesome social media tool especially if you want to schedule posts on social media for later publication. Buffer is indeed an awesome premium social media tool you should invest in as a blogger for wider reach. Postplanner is yet another awesome premium social media tool you should invest in as a blogger especially if you want to grow your Facebook reach. 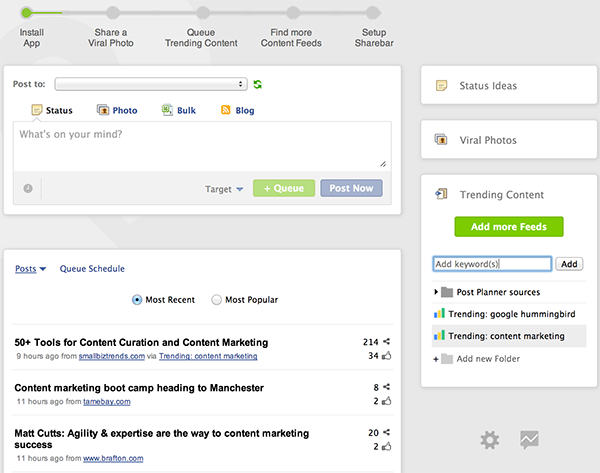 Postplanner lets you easily schedule viral Facebook posts to all your Pages in less time. It is impossible to predict which content will perform well on Facebook. Postplanner will help you find and share posts that can go viral on Facebook. So instead of wasting money on Facebook ads every month, try Postplanner and see your social media reach improve. Postplanner is best for page owners, its viral photo feature can greatly improve your Facebook engagement and reach. Social Report is a social network analytics solution that allows you to track your social network accounts just the same way you would track the performance of your websites. Social Report is indeed an awesome premium social media tool to analyze and gain great insight into how effective your social space and marketing campaigns are performing. Social Report can track membership, demographics, interests, geography, education, employment and many other aspects of your social space and provide you with the right tools to manage your marketing initiatives. With this information, you can improve your return on investment by increasing relevant aspects of your social presence, and make money. You’ll be able to compare your social accounts and understand the difference among them when it comes to their impact on your business. All of this information is presented in intuitive, thorough, visual reports. ViralWoot is yet another social media tool you have to invest in as a blogger if you want to drive good traffic from Pinterest. ViralWoot allows you to schedule pins to your boards, follow other Pinterest users, repin and like other people’s pins. ViralWoot can help you grow your presence on Pinterest for just $15 a month; you can increase your schedule pin limit buy purchasing seeds at least once. You can even add multiple Pinterest accounts on ViralWoot. The best part of buying seeds of ViralWoot is that it helps you to build your followers very quickly. This is different from buying followers for your account because the followers you will get are real people who decide to follow you, it’s not automatic. As you can see, no matter what task you are struggling with when it comes to social media there is a tool that can help make it easier. So as a blogger you can take advantage of these tools to building a stronger social media presence and improving your social media reach with less work and time. This article doesn’t really actually tell you HOW to improve your social media campaigns at all, it is mostly just listing the analytical software that has been around for a while. You have also failed to mention TweetDeck, it may not be quite as good as Hootsuite but it’s free! There are actually some great tools out there to help bloggers find stories worth writing about and that will generate them some real traffic. The scope of the article is not really about how to improve your social media campaigns, its simply a list of tools you can use to improve your social media reach with minimal effort and less time. Thanks for adding TweetDeck but its not a premium tool. So you should look at the title once again to understand what the article is all about. Well said, the tools listed in this article can greatly help one improve one’s social media reach with minimal effort and less time. Great list, Nwosu. ViralWoot looks interesting. Pinteresting is sending a lot of traffic these days. Some of these tools are fantastic, although I’m slightly surprised that ManageFlitter isn’t on the list. For me, that’s one of the most powerful tools for engaging and growing on social media. Thanks Marty for your contribution and for suggesting ManageFlitter, will check it out. Nice List. The most important tool to invest in with all content creation is a strategy. If you do not have a strategy and plan, no tool will yield the results. I personally use some of the tools listed. That said I would agree with Marty that Manageflitter should be included. The product has a great interface and is very easy to use. Awesome. The most important tool to invest in with all content creation is a good plan. If you do not have a strategy and plan, the tools will be useless. Interesting read and a great list of tools. Will definitely be trying Hootsuite and also Manageflitter as, suggested by others in the comments.